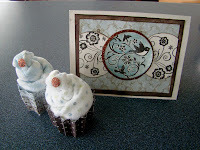 Here are some visual steps to make some washcloth cupcakes. Super simple! 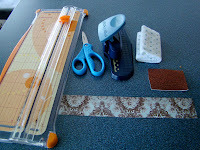 Start with a piece of patterned paper 1"X7" and use a decoration border punch along one side if you wish. Then fan fold it. Next, adhere the two ends together to make the bottom of the cupcake. 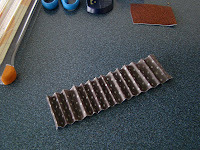 If you attach it on an angle the bottom part will be narrower than the top. 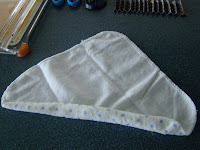 Take the baby washcloth and roll tightly from corner to corner. 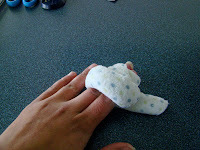 Wrap it around two fingers twice, take the tail piece and push it up through the middle and then tuck the corner back in. 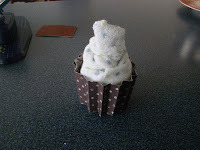 Place the washcloth into the paper cupcake holder, adjust, add a glitter cherry on top. blog hop from Feb 7 - Feb 10 2011.
you could win one of two great prize packs! Project created with the Scraptivity March kit. So so cute! I was just looking for a tutorial on this for my daughter's cupcake birthday next week. Thanks for posting how to make these. I was also wondering what you used for the cherry? Is it a pom pom? Glad it could help you! The cherry was cut from some glitter sticker paper. I just cut a circle out and peeled off the back and stuck it on. Any sticker would work, and a pom pom would look great too! Oooh thanks for posting this, can't wait to try it. I thougth the cherry was a pom pom too. It looks 3dimentinal in the photo. Hi its a nice and simple way to make this beautiful cupcake! But i have a question, you mentioned: adhere the two ends together to make the bottom of the cupcake. If you attach it on an angle the bottom part will be narrower than the top. Does this mean the bottom would be open? as there is basically no support at the bottom. Thanks!